The hunter education course provides training in firearms safety, wildlife conservation, and respect for our natural resources, landowners, and other hunters. Graduates receive a lifetime certification recognized by all states, Canadian provinces, and Mexico. Since originating around 1950, over 30 million students have completed the hunter education training in the United States. Conclusive evidence shows that the hunter education course has dramatically reduced hunting related firearms accidents — up to 75% in some states — and has brought about positive change in hunter skills, attitudes, and behavior. If you were born after January 1, 1986 and are 18 years old or older, you must have successfully completed a hunter education course before you hunt in the units listed above. born on or before January 1, 1986. In addition, hunter education certification is required before anyone may legally hunt in the following areas in Alaska: the Anchorage Coastal Wildlife Refuge (14C), Eagle River Management Area (14C bears and small game), Palmer/Wasilla Management Area (14A shotgun for big game), Eklutna Lake Management Area (14C bears), and the Mendenhall Wetlands State Game Refuge (hunters under 10 who are not certified can hunt as long as they are under the direct supervision of an adult). 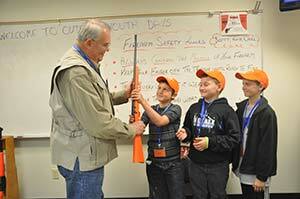 Hunter education certification is required for all youth hunters participating in "Youth Hunts." The hunter education certification is valid in any state where hunter education is required to purchase a license. 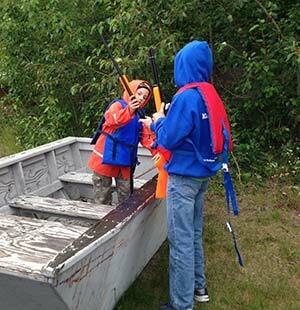 Hunter education classes are taught by dedicated volunteer instructors who commit valuable time and expertise to providing instruction to over 2,000 Alaskans of all ages each year. The next time you have a safe and enjoyable hunting experience be sure to thank a volunteer. Hunters wishing to hunt in a weapons restricted area must successfully complete a course for the weapon with which they will be hunting. Certain bowhunter, crossbow, muzzleloader, and shotgun hunts also require the hunter to be in possession of a hunter education certification too. See the Alaska regulations for weapons restricted hunt information. Weapons specific certification courses (crossbow, bowhunter, muzzleloader) DO NOT satisfy the hunter education certification requirement, and hunter education DOES NOT satisfy the weapons specific certification requirement.